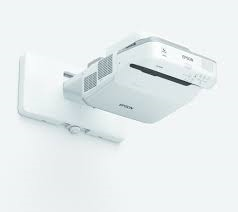 This projector offers superb interactivity thanks to its dual pen capability. With a brightness level of 3,200 lumens and HD-ready WXGA resolution, the EB-675Wi’s ultra-short-throw design allows you to present large images from a very short distance with minimised shadows and glare. A 14,000:1 contrast ratio and HDMI input mean that students benefit from sharp, clear images. Epson’s interactive pens are now even more responsive and easy to use when annotating directly on screen. With the new dual pens, teacher and student or two students can work simultaneously using different attributes. Wirelessly display content easily from a range of smart devices and Google Chromebooks using our iProjection App2.